You can delete pencil texture palettes that you do not need. NOTEYou should not delete any pencil texture that is used in your project, as pencil lines using a deleted pencil texture will become solid pencil lines. In the Colour view, make sure the Edit Palette Mode toggle button is pressed in. In the palette list of the Colour view, right-click on the selected palette and select either Get Rights to Modify Palette or Get Rights to Modify All Palettes. From the Colour view menu , select Palettes > Get Rights to Modify Palette or Get Rights to Modify All Palettes. In the Colour view, click on the Show Pencil Texture Palettes button to display your pencil texture palettes. In the palette list, select the pencil texture palette containing the desired pencil texture. 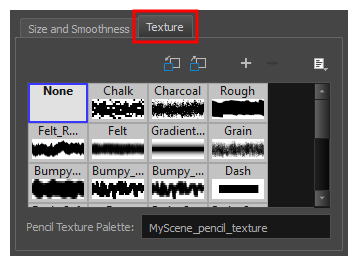 NOTEThe texture library in the Texture tab lists the same pencil textures as the ones in the currently selected pencil texture palette in the Colour view. 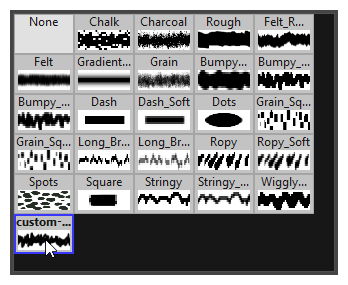 In the pencil texture library, select the texture you wish to delete. Click on the Delete Texture button. Open the Brush menu and select Delete Texture. The selected pencil texture is removed from the pencil texture palette.